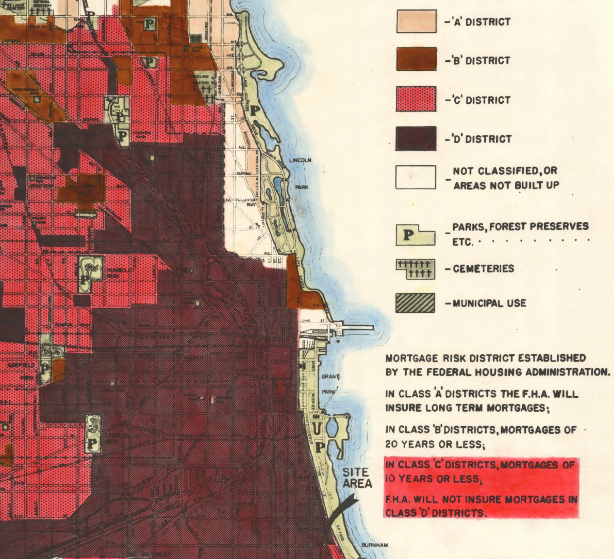 A 1938 FHA map of Chicago. Note the loan guidelines for each color-coded zone on the bottom right. By now, certainly, you’ve heard of Ta-Nehisi Coates’ landmark piece on reparations in The Atlantic. If you haven’t read it, the essay is less about reparations per se – writing checks and so on – and more about grappling with and acknowledging the basic sources of American racial inequality. I won’t quote any of it here; you really just have to read it. Certainly you should read the middle sections, in which Coates lays out, better than anyone I’ve seen, the established facts: how federal housing insurance policies, contract buying, and good old-fashioned violence, both mob and state-sponsored, led to the segregated, deeply unequal world we currently inhabit. If you think you already know the story, and you are not a professor of 20th century American history, you are probably wrong. Go ahead and read it. Pete Saunders and others have already said it better than me, but this is all central to the American urban story: not just if you care about housing disparities and the racial wealth gap, but if you’re interested in urban design choices that were made in and around inner city neighborhoods; or if you’re interested in why so many urban neighborhoods were locked out of loans to fund rehabilitation and reconstruction of aging buildings, condemning them to decline and setting the stage for gentrification once the artificial barriers to development were removed. The bottom line is that, to a great extent, we don’t have to wonder about why Chicago is so segregated, and whether it matters. The research has been done. The answers, as Ta-Nehisi Coates likes to say, are knowable. And we all owe it to ourselves to know them. I’m German, and I’ve been to St. Louis two years ago. I was incredibly shocked how segregated this city was, and that every St. Louisan knows exactly the streets and borders where you are still on the good side of St. Louis and where not. Yeah, it’s pretty shocking to people from other countries. For Americans, I think it’s both shocking, when actually seen, but also taken for granted as the way cities work. Hopefully Coates’ essay helps to change that. You are very optimistic. My experience in St. Louis was that most people just don’t care. When I tried to talk about that, they got defensive. The most important thing was that you don’t live on the “bad” side of the city, and never ever go there. I don’t know that I’d call myself optimistic – I think there’s not a whole lot that can be done to change the facts of racial segregation on a large scale. Maybe I’m wrong. Anyway, I think a large part of it is that people don’t care: or maybe more precisely, that they think poor, segregated neighborhoods have ended up that way because the people who live in them are deficient, and as a result they (the non-residents of poor, segregated neighborhoods) don’t think there’s anything they can, or should, do about it. But even people who do feel that it’s a shame feel, I think, a great deal of confusion and powerlessness about it, largely because the history of American ghettos – the story of how they came to be – just isn’t something that’s taught or broadly understood. Yes, that’s exactly the problem: Most Americans seem to think that how those neighborhoods look like is the fault of its inhabitants.